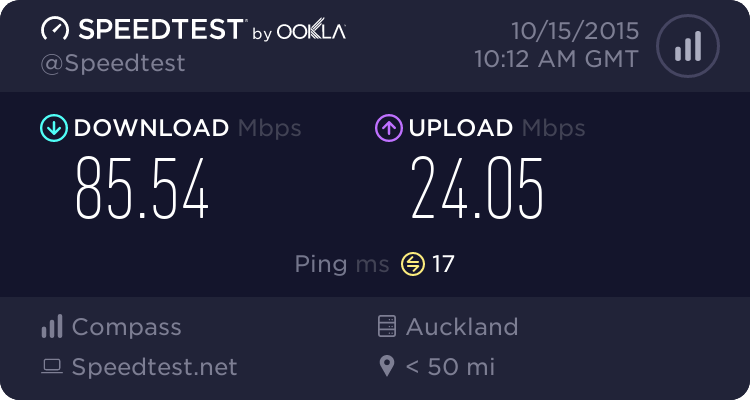 I am disappointed in the Speedtest.net tests I have been getting on the Compass Communications UFB network. I am only on the 30/10 Plan, I am pleased I did not go for the larger 100/20 plan. Below are some tests I had done to various sites overseas in May while on Spark and now in October on Compass. Note Speedtest do not have Compass as an ISP option so I have left it showing as Spark for the October results. I realise I would not get a similar result to other countries as I get in NZ but I expected a little more than what I am getting. 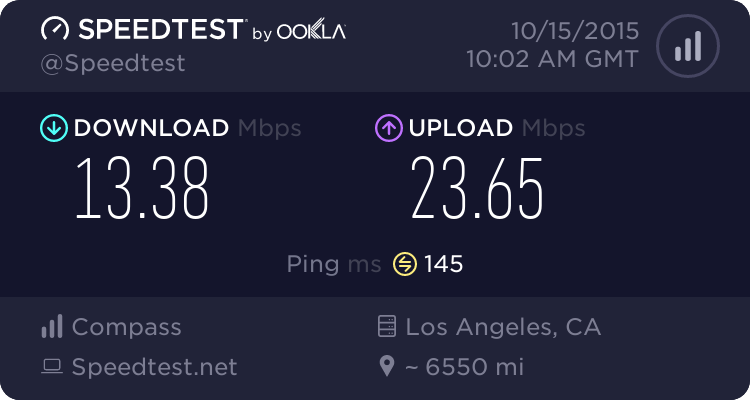 What do others get on their Speedtest.net tests to places like Los Angeles, London, New York, Bangkok. Note I have been testing to Bangkok as my wife comes from there and wanted to stream TV. Currently I get a lot of buffering from there. Compass probably has higher contention (active user's per total bandwidth) on it's international bandwidth/transit than Spark. Are you performing these tests on a desktop/laptop connected via network cable? What OS? Wifi will give varying results. Newer OS's have better networking (large tcp/ip windowing, window scaling), better throughput. Ragnor: Compass probably has higher contention (active user's per total bandwidth) on it's international bandwidth/transit than Spark. Wait wut? There are ISPs out there that actually congest international at peak times? how quaint. I am using an ethernet cable on a 1gig interface on my desktop and router, running Windows 10 so none of that is the issue. 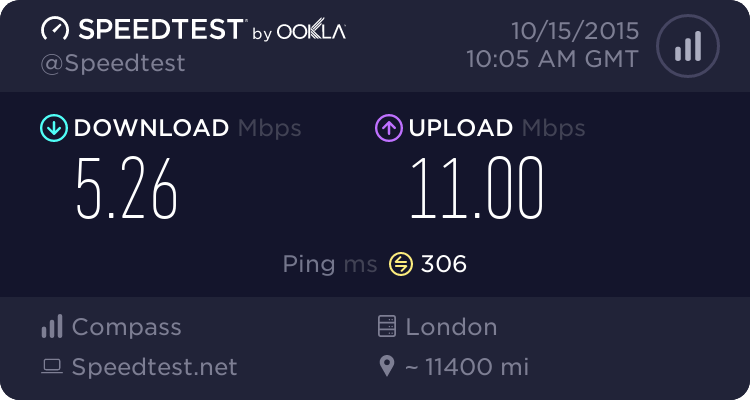 What sort of downloads on Speedtest do you get from places like LA, London, New York, Bangkok? That's what I get on 100/20 Compass UFB in Chch. Steam, YouTube and Aus/NZ cached content always full speed, HD streaming never buffers. In game pings are low to Aus, 150 ms to US west. Thanks for those Compass Tests, they look broadly similar to mine, probably depends on the time it was done and also the day. 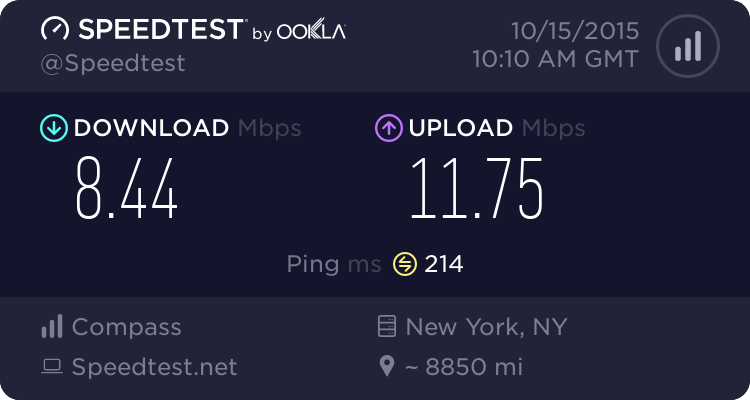 I hope someone else with a different ISP also posts some test results here so I can compare. Why do both columns show Spark as your ISP? Ummmmmmmmmmmm... Where it says ISP, that's who Speedtest determines your connection to be with. For some reason, even though you're with compass, Speedtest thinks you're still on a Spark IP address. Feel free to PM me your current IP address and I'll make sure it's not one of ours. However, your IP address is definitely assigned to you from Compass... It's just a little unclear why they are using that range. Can someone please run some speedtest tests from a different ISP so I can compare the results I got from Compass? Los Angeles, New York, London, Bangkok. The only issue I have though is my original Spark Speedtests in May etc never reached anywhere those speeds. I was on ADSL2+ 1ith a Line Rate of 15Mbps so going on your results I should have been getting upwards of 11-12Mbps or so on Speedtest. The following is a summary of the Speedtest results from myself (the first lot) and 2 others. Clearly there seems to be an issue with Compass compared with Spark. I will log a fault with Compass tomorrow but don’t hold out much hope for an early resolution if any at all. I had logged a fault on another matter related to the phone on 9/10/2015 with Compass. They did call me on Monday morning 12/10/2015 and promised to call me back on Monday afternoon after talking to their Network Guys. Customer Service is pretty abysmal.